It rained overnight. It looked like it was over at dawn. I was ready for an early start today. But then the showers rolled back in. Between the showers was heavy drizzle. It just wouldn't end. I kept delaying my start. I didn't intend to do a hard day today after the long tough day yesterday, so I just decided to let the rain play itself out. Finally it ended at 1PM. By then I was working on my book, so it was another half hour before I switched gears and got back into 'trail-mode'. STROLL NO. 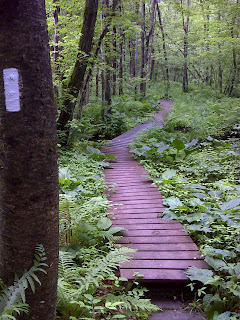 1: 1¼ miles of trail north, crossing MA 41 and back. It was a long woods walk, including a section beside a moss covered old stone fence, then a short field walk to MA 41, followed by another short field walk between the tallest wheat I’ve ever seen (over my head) and a sheep grazing field. 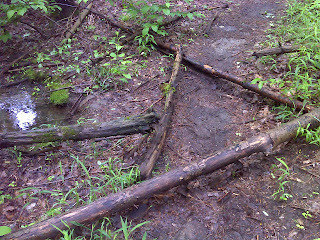 There was a small stream crossing then a walk through some deep hemlock woods where I turned around on the slope down to a swamp. More on that swamp in a minute. I returned to Jug End Road, passing an unusual spring welling up from flat ground right next to the trail - and an even more unusual formation of sticks beside it (sly grin). STROLL NO, 2: I moved to the nice S Egremont Road parking area and hiked another 1¼ mile piece of trail south. This was all swamp and after this morning’s rain it was swarming with mosquitoes, so much so that I couldn’t stop for a second without being overwhelmed by them (thus no photos). The northern part was open frog-pond swamp with some pretty little deep blue flowers and some clumps of yellow and purple iris in bloom – in all about a quarter mile of open swamp, then after a stream crossing, the trail passes a gigantic old Red Oak and soon enters a dark hemlock woods that is in swampy bottomland. That continues for the rest of this leg until the trail climbs up a slope to my turn-around point. Then back through the torture chamber of mosquitoes! STROLL NO. 3: I made only a quick stop at the parking lot to get a snack then headed north for the third 1¼ mile leg of the day. This started by passing the Shays Rebellion monument on S Egremont Rd, then there is a pretty field walk followed by a woods walk over a hill – the only part of today’s hiking with any elevation change. Emerging from that hill walk, the trail skirts the edge of a long very peaceful (no road noise) corn field, coming out at West Rd. That’s where I turned around and had the pleasure of walking this three-part section again: cornfield with no bugs, hill climb and descent in the woods (again no bugs), then very pretty field walk with Jug End and Mt Everett beyond, and some pesky deer flies. These biting flies just began to appear a few days ago, and only occurred in this field today. STROLL NO. 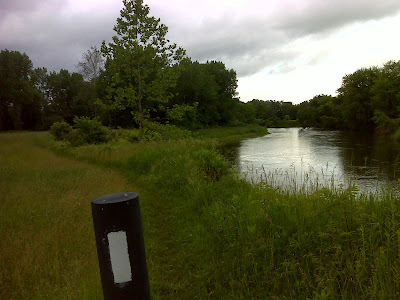 4: I then moved to the little secluded parking area below the Kellogg Rd bridge over the Housatonic River and hiked the final 1¼ mile piece of trail for the day. This was by far the most varied and interesting. 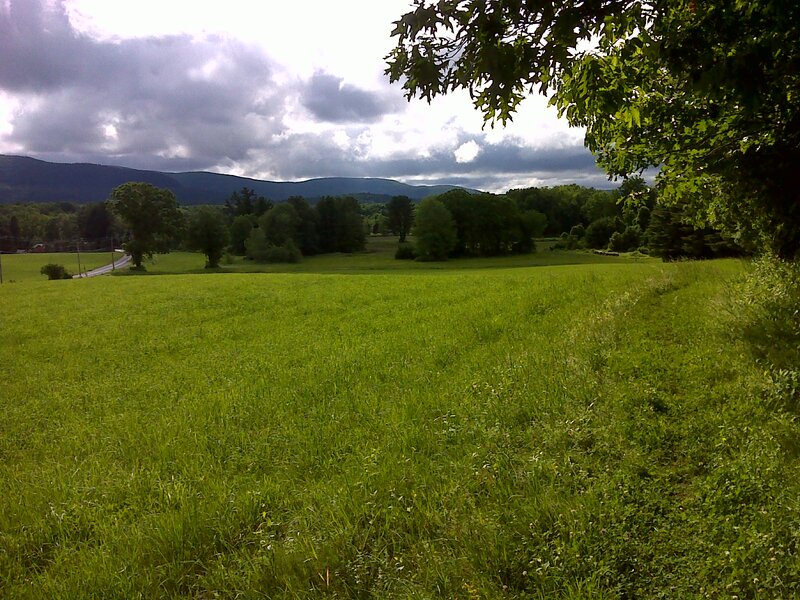 The first third of it follows the banks of the Housatonic beside four fields and one small wetland. Three of the fields are planted in corn, the fourth is hay and provided this great view of the river. What I look for in a good 'trail scene' photo is a long stretch of visible trail in an interesting setting, with a white blaze prominent. This shot has it all. All of these fields are National Park owned and leased to farmers (usually the former owners) to preserve them in their historic condition. There’s a great example of a green tunnel just before crossing US 7. For my taste, a good green tunnel scene has to have interesting foliage, flowers help of course, and there has to be 'light at the end of the tunnel'. 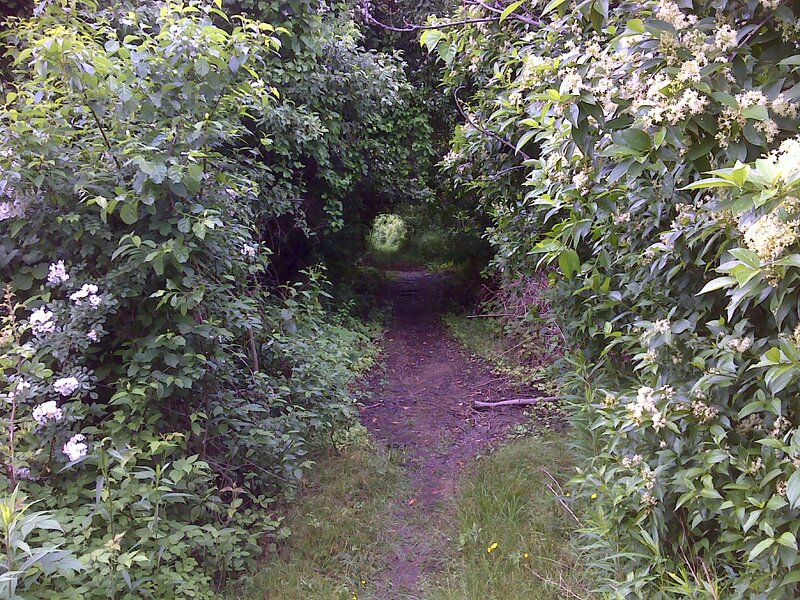 Then just after (south of) the US 7 crossing the trail passes through a wetland where no puncheon is provided. The grasses in this short piece of a longer field are the type that only grow in wetland, so it’s surprising that there is no puncheon here. Since we’ve had so much rain lately, there was no way to walk through without getting my feet soaked, though the water was no more than a couple inches deep at worst and it wasn’t muddy underneath (probably why there was no puncheon?). The rest of this field between US 7 and the railroad tracks was dry and the grass was short. You pass a pretty little pond on your left (southbound) then turn left and walk between that pond and the railroad tracks for a bit, cross the tracks and enter a short bit of woods. From there the trail crosses a very pretty swamp with skunk cabbage and ferns as ground cover and a canopy of wetland trees. This crossing is all on a nice boardwalk made of recycled plastic planks. On the far end of this boardwalk, the trail turns and skirts this swamp on a long stretch of very pretty side-hill trail (well constructed) in a narrow corridor of thick woods and quite steep slope between the swamp and a hayfield. This ends when the trail emerges at West Road, my turn-around point. Then it was back through each of these unique features once more, getting my feet re-soaked, of course. Officially this was 5.4 miles of trail (10.8 miles of hiking) - a short day. For me, strolling along without a pack, it felt close to a 'nero' (a near-zero day). But it's all good. I'll be all the fresher for tomorrow's hike, and tomorrow's weather looks good. Here's the map of today's travels. The straight lines connect the three parking lots where I launched the various strolls, driving between them with the GPS turned off. 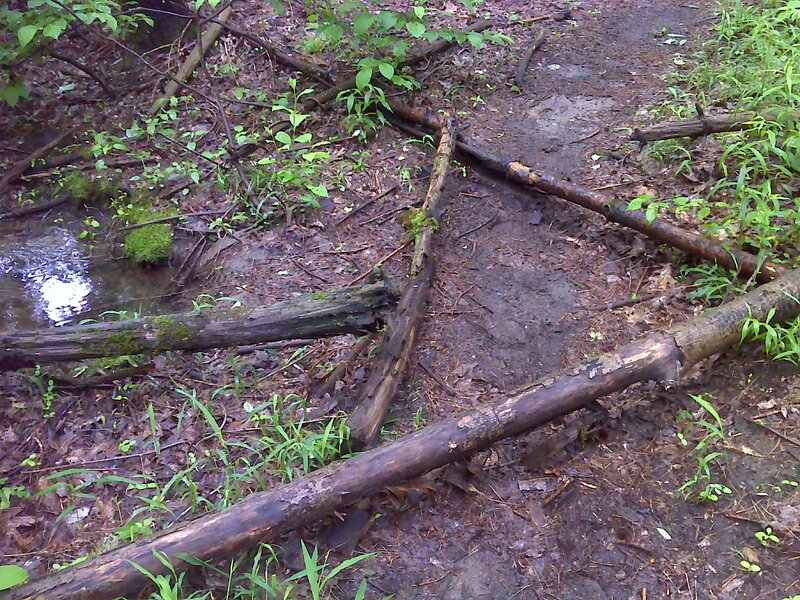 If EveryTrail would simply plot the actual GPS recorded points rather than trying to connect them with straight lines, this mess wouldn't be there. Sorry, but beyond convincing EveryTrail to offer a choice as to how to plot the trip data, I can do nothing about this. The title line above the map is a link that takes you to all the photos I've uploaded from today's hiking.